A fungal nail often develops from athlete’s foot, which is a fungal skin infection. If athlete’s foot is not treated in time, the fungus may spread to the nails. The organisms that cause fungal nails live in warm, humid environments. 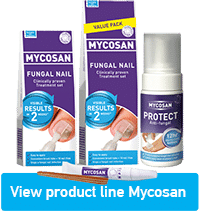 That is why you can be infected with the fungi that cause fungal nails when you are in a public, humid environment such as a sauna, gym, public showers or swimming pools. When your finger is caught between doors, when you hit your finger with a hammer or stub your toe against the leg of a table, this causes damage to your nail. It often happens that the nail comes loose from the nail bed. The size of the area that has come loose determines the area where fungi can penetrate into the nail. When other members of your family have a fungal nail, there is a good chance of you getting infected through the shower floor, sheets, etc. 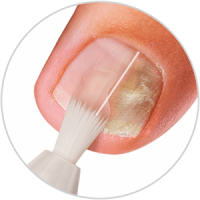 Fungal nail is more common in toenails than fingernails, because toenails are often enclosed in the dark, warm and humid inside of your shoes – an ideal place for the fungi to grow. Another cause may lie in the fact that feet receive less blood flow than fingers. Therefore it is more difficult for the immune system to detect and fight the fungus. Fungal nail infection is the most common foot problem, 1 in every 4 persons suffers from a funal nail infection. The increase of this problem may be due to wearing tight shoes and increasing use of public areas such as dressing rooms and saunas.